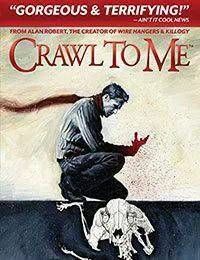 106 pages!Wire Hangers creator/hard-rock musician, Alan Robert, is back for blood with this all-new horror tale, Crawl to Me. The story centers on Ryan, as he struggles to protect his family from what appears to be an evil entity living within their basements crawl space. It is only after a series of violent events occur, that Ryan realizes he must set aside all he believes to be true in order to face his shocking and inevitable reality. This intense thriller will keep you guessing every step of the way.